Each Kindermusik class is a world of discovery and adventure. In every class, you’ll witness your child’s developmental evolution in language skills, literacy, listening, problem solving, social skills, self-esteem, and musicality. It all happens within a nurturing environment-full of energy, imagination, music, dancing, and playful delight. Kindermusik provides the time and tools to help bring the power of music into your home and your child’s life forever. An integral part of every Kindermusik program, your Kindermusik At-Home digital materials include the highest-quality creative activities, beautifully illustrated children's books, and specially designed instruments – created to complement the music and Kindermusik classroom experience. By adding new concepts and challenges along the way, each age-appropriate program acts as a stepping stone to the next-paving the way to a musical journey that can last seven magnificent, musical years. Kindermusik International provides a training and licensing program for individuals to teach Kindermusik. On their own, or partnered with community and national organizations and businesses, educators provide classes in many different settings, such as private studios, music academies, community centers, churches, and retirement communities. Cuddle, bounce and bop with your baby in Kindermusik's newest curriculum. Whether your baby is five weeks or five months, this class will be perfect for you! With aga-appropriate activities for newborns, infants and crawlers, this parent-child music and movement class will help you strengthen those early parent-child bonds, understand your baby's development, and heavilty focus on child develoopment and communication with your baby. You and your baby will enjoy instrument play, dance, exploration time and together time — and you'll get expert advice and parenting resources based on the most recent research in baby development. This music-filled class celebrates the unique joys of your growing child. Each week your child will love singing, dancing, and playing instruments with you and her new friends and you'll love helping her practice a wide variety of abilities such as gross and fine motor skills, turn-taking, social skills and active listening. In class, we'll also share tips and ideas for using music throughout the week. Plus, the fun (and learning!) continue with the Kindermusik@Home digital home materials, including music from class, musical activities and each month's story. Each week in class we combine your preschooler's natural love of music, storytelling and imaginative play with age-appropriate activities that introduce early music concepts and foster independence, social and emotional skills, language growth, and self-control. We also connect you with other parents who share in the wonder of parenting a preschooler. Parents join class for the final activities. The Kindermusick@Home digital home materials bring the music, activities, and each month's story everywhere you go. The repetition enhances the learning — and the fun! From the moment you became a parent, you wanted the best for your child. In class, we engage your child in music and movement activities that also promote language, social and emotional skills, early math and early literacy, physical coordination, creativity and more. Plus your child will learn basic music vocabulary and notation — all setting the stage for future school success and formal music lessons. Parent join the fun for the final activities. The Kindermusic@Home digital home materials extend the benefits all week long with music from class, activities for the whole family, and each month's story. Get ready to sing, play and move with your little one in this high-energy music class designed to be just right for very young childresn. This new Kindermusik curriculum focuses on your child's beginning movement, helping to build the muscles your young toddler needs to walk, run and climg; and on vocal development, helping to nurture your child's speaking and singing voice. With a mix of both parent-child joint activities and chold-focused activities, you'll be able to join right in on all the singing and dancing while also getting the chance to observe how your young toddlerlearns on his or her own. Embark on Kindrmusik's fun new exploration of singing, swaying, laughing and playing through Sing & Play, a just-right mix of early-childhood vocal play and language development, together time, and music and movement activities! Kindermusik Wiggle and Grow and Laugh and Learn is the perfect way to include the whole family in Kindermusik! Activities reflect the successful crescendo-decrescendo arc multi-age class as well as suggestions for "All Together Now" moments. Qualified, caring instructors offer suggestions and tips on development for parents and care-givers. Listen as your child astonishes you with her newfound ability to create musical compositions. Kindermusik for the Young Child provides a pressure-free, developmentally appropriate transition to musically succeed before taking on more formal instruction.Kindermusik provides the opportunity to explore voice development, rhythm, notation, musical symbols and authentic pre-keyboard, string and woodwind instruments. Young Child helps every child develop a confident, joyful voice for singing and speaking as well as essential building blocks for a future of learning. Designed for children ages 4½ through 7 years, classes meet once a week for 60-75 minutes. 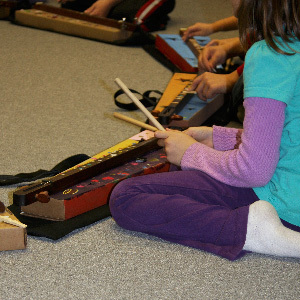 Students explore many facets of the musical experience – speaking, singing, moving, dancing, listening, creating and playing instruments, as well as learning about reading and writing music. As the capstone to the child’s Kindermusik journey, Young Child broadens and deepens the child’s introduction to the fulfillment and excitement of musicianship.